The number of open-access journals and publications is growing rapidly. These publications can be viewed and assessed by a wider audience, allowing for a broader and more rapid spread of the research. Open-access publishing operates in the same manner as a traditional journal, except that the cost of publishing is covered by the author or a funding body. Once a publication is accepted, it becomes available for free online. A lot of offshore renewable energy research is undertaken by small companies with limited budgets, and just like in the case of open-source software, having free resources can have a huge impact. MoorDyn is a lumped-mass mooring line model designed for easy coupling with other software (i.e. floating platform models). It supports arbitrary line interconnections, clump weights and floats, and different line properties. 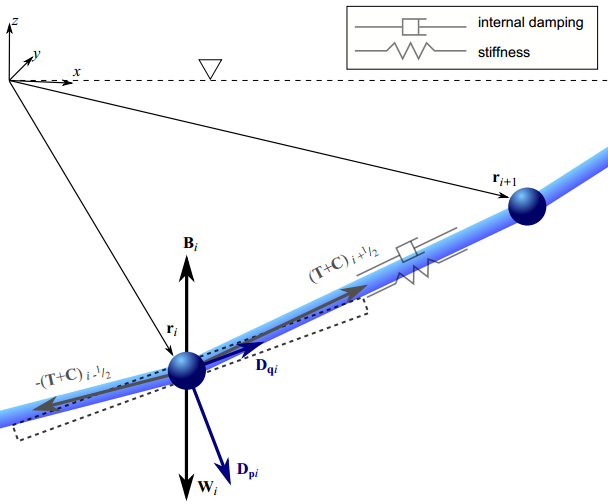 The model accounts for internal axial stiffness and damping forces, weight and buoyancy forces, hydrodynamic forces from Morison’s equation, and vertical spring-damper forces from contact with the seabed. The original version is written in C++ and has been successfully coupled with FAST v7 and other tools/models in Matlab and Simulink. A separate Fortran-based version has recently been incorporated into FAST v8 (nwtc.nrel.gov/FAST8). More information and downloads can be found at www.matt-hall.ca/software/moordyn.